With ever increasing prices of gasoline and the environment getting polluted due to emissions of harmful gases by the petroleum products, more and more people are trying to switch over from gasoline-powered vehicles to electric cars. Those having a gasoline-powered internal combustion engine car need not buy a new electric car; instead they can replace the present internal combustion engine with electric motor. Electric motors are of two types: alternating current (AC) motors and direct current (DC) motors. Anyone of the two types can be fitted in an electric car. However, electric cars with AC motor are very uncommon except those large electric cars produced by leading automobile manufacturers. AC motors generate more electric current for their size and are lighter than DC motors. In contrast, AC motors are also complex for those interested in installing it in their vehicles as a do-it-yourself (DIY) job and in addition, they are costlier than DC motors. This is why most people prefer DC motors for all electric car conversion jobs. There are several advantages of using DC motor for electric car conversion jobs. Firstly, it is easier to purchase if one is familiar with specifications and other details of DC motors. One can get reconditioned DC motors at very affordable prices in local markets; sometimes even at throwaway prices. The reconditioned motors are durable and if it was reconditioned lately, one can expect to last even longer than the car itself. Electric DC motors are known by their diameter and the larger diameter motors have the capacity to generate higher horsepower. However, one should keep in mind that this size of motor consumes more electric power and needs more number of batteries. It is also necessary to charge the batteries quite often. It is, therefore, important to strike a balance between electric power and reasonableness. A DC motor with a diameter between nine and thirteen inches will meet all the requirements and these are the sizes normally used in electric car conversions. A motor in this range of diameter offers enough output as well as horsepower to achieve a speed of 55 miles per hour and can easily cover a distance of 150 to 200 miles between charges. 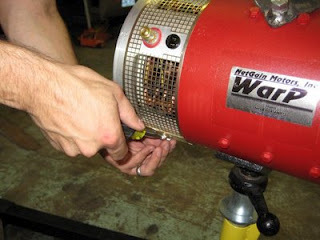 A DC motor in the 9 to 13 inch diameter motor range will also function properly with deep cycle batteries, which are widely preferred for electric car conversions as DIY tasks It is a fairly simple job to install a motor in the present internal combustion engine vehicle for converting it into an electric car provided the guidelines are strictly implemented. One obviously needs a helper for this as the motor weighs approximately 150 pounds. A new electric car motor will cost anywhere between $1000 and $5000 depending on its diameter. However, it is not advisable to go in for a new motor as a reconditioned motor costs very little and lasts much longer than the car itself. One can get a lot of these inexpensive and durable motors in the local markets, if only he can devote some time. This saves as much as $1000 or even more. In this effort, the services of a knowledgeable guide are very useful. The time required for installing a new electric car motor or a reconditioned one is the same. It is also important to look for a used electric car motor in the right places so that one can get the best deal and save some money. Electric car conversion involves a careful planning and step by step approach carefully following the guidelines on car conversion. Before taking up car conversion, one should make sure that the controller, motor, batteries and are other parts required fit properly into the car one proposes to convert into an electric vehicle .With proper planning, suitable guidance, it is possible to complete the total car conversion much below $500. I have done conversions, using forklift motors, so I am not a newbe. I have seen Les & Jane’s stuff, that is not much help to me, I know all what he says, I am a Millwright. I need help in finding the new ac hiper motor at a good price!! but if there is a true EV green person out there, that can help me, I have to work, most of the day. WHO has the best EV motor and controller for sale?